SAUSAGE curry with cumin, fennel and coriander is just one of 80 home-cooked recipes that will be featured in Dan and Steph's second cookbook out this June. 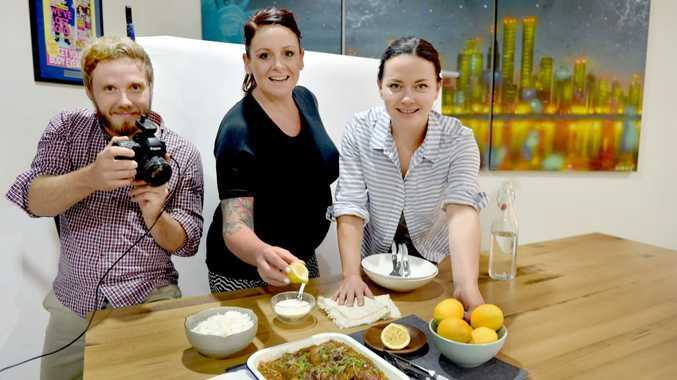 Dan and Steph Mulheron have been burning the candle at both ends to cook 46 dishes in four days for their Eat, Meat, Sweet cookbook photoshoot - waking at 6am and cooking all day. "We are in day two and are ahead of time," Steph said. Having shot 17 dessert recipes on Monday, and 15 main dishes on Tuesday, the couple have two days left to complete the whole book. "It's a lot of hard work and we could not have done it without our food stylist Krista Graham and photographer Glen Wilson who are both local," she said. Steph who is due to give birth to a baby girl in April hinted that their next cookbook might just feature raw baby food recipes. The couple have 500 signed copies of their first cookbook Eat @ Home which are now available at their restaurant, Eat @ Dan and Steph's at 449, The Esplanade, Hervey Bay.